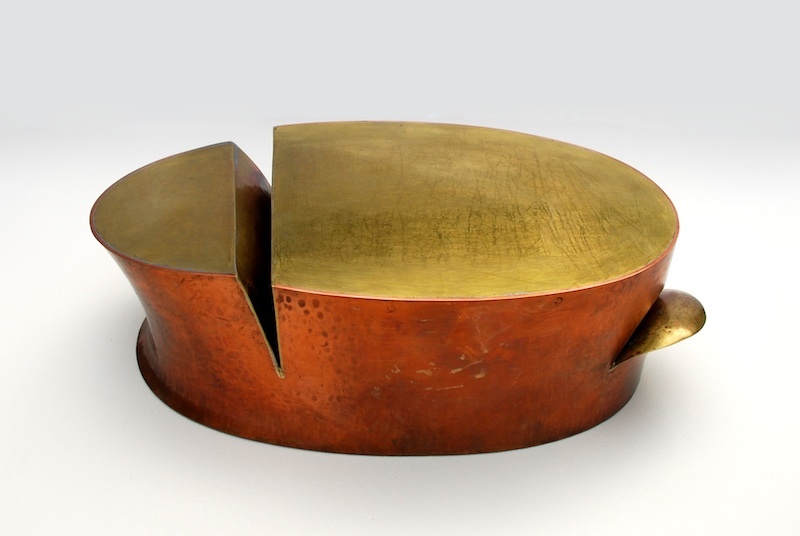 The Samuel Dorsky Museum of Art at SUNY New Paltz presents In/Animate: Recent Work by Myra Mimlitsch-Gray, an exhibition by internationally renowned metalsmith and head of the College’s Metal program, Myra Mimlitsch-Gray. Curated by Akiko Busch, a distinguished writer on design and the environment, In/Animate will be on display in The Dorsky Museum’s Sara Bedrick Gallery from Aug. 31 through Dec. 11. A public opening reception will be held Saturday, Sept. 10, from 5–7 p.m.
In/Animate collects more than 50 meticulously crafted works that together explore a variety of artistic processes in iron, copper, brass, silver and enameled steel, sparking new conversations about how household objects can express ideas about presentation, utility and class. Mimlitsch-Gray’s works all possess a deep sense of materiality. She was trained in the craft tradition, and describes her intention as “acquiring mastery while deconstructing the model.” Her works are distinguished by the physical processes of their making – her hand wrought, hand shaped, hand hammered, hand finished pieces are elegantly conceived and immaculately crafted, advancing ideas about form and utility to a new level. Mimlitsch-Gray’s domestic artifacts suggest a coalescence of body and thing, conveying the mutability of the animate and inanimate and reflecting the intimacy between people and the objects they use. A spoon can be a lip; a dangling twist of fabric is a vein. Here we find form and materials ordinarily associated with sufficiency and comfort recast to convey new and unsettling meanings. In/Animate is accompanied by a fully illustrated, 72-page catalogue featuring texts by Myra Mimlitsch-Gray, exhibition curator Akiko Busch and Daniel Belasco, the curator of exhibitions and programs of The Dorsky Museum. The catalogue is designed by Group C Inc., and will be available in September 2016 at the museum or online at SUNY Press. A special public program consisting of a gallery talk and tour of the SUNY New Paltz Metal program lead by Mimlitsch-Gray and Busch will be held on Saturday, Oct. 22, from 2–5 p.m.
Funding for In/Animate is provided by the Friends of the Samuel Dorsky Museum of Art, the Samuel Dorsky Museum of Art Contemporary Art Fund and SUNY New Paltz. Visit The Dorsky’s website at www.newpaltz.edu/museum for information and updates. , 4 x 14 x 8 in. Courtesy the artist. Myra Mimlitsch-Gray holds a Master of Fine Arts degree from Cranbrook Academy of Art and a Bachelor of Fine Arts degree from Philadelphia College of Art. She is the recipient of the 2016 American Craft Council Award and an inductee of its College of Fellows. Other awards include the 2014 Individual Artist Fellowship in Crafts/Sculpture from the New York Foundation for the Arts, the 2012 United States Artists Glasgow Fellowship in Craft and Traditional Arts, and Individual Artist Fellowships from the Louis Comfort Tiffany Foundation (1995), the National Endowment for the Arts (1994) and the New York Foundation for the Arts (1997, 2005). In 1998 she was honored for her work as an educator at SUNY New Paltz with a SUNY Chancellor’s Award for Excellence in Teaching. 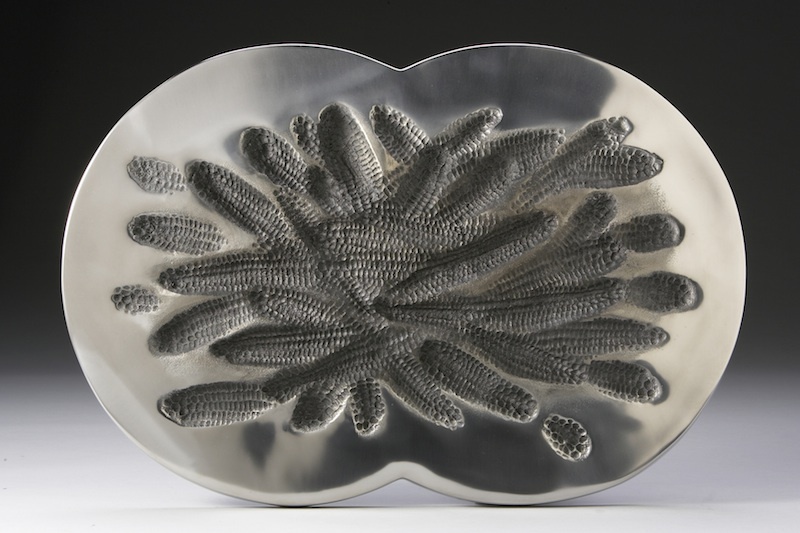 In 2014 the Metal Museum in Memphis, Tennessee named Mimlitsch-Gray “Master Metalsmith” and presented her first museum retrospective, Staging Form. Her work has been featured in solo exhibitions at venues such as Sienna Patti Contemporary, Wexler Gallery and the John Michael Kohler Arts Center, and is currently on view at the Museum of Fine Arts, Boston, and the Yale University Art Gallery. Mimlitsch-Gray currently directs the Metal Program at SUNY New Paltz, among the largest and highest-ranked public university metal programs in the nation. The program’s rigorous curriculum provides opportunities to explore all aspects of contemporary jewelry and metalsmithing in a state-of-the-art facility with educators who are actively engaged artists and who exhibit and lecture internationally. Akiko Busch writes about design, culture and nature for a variety of national magazines, newspapers, and exhibition catalogues. She is the author of Geography of Home, The Uncommon Life of Common Objects and Nine Ways to Cross a River. Her most recent book is The Incidental Steward, a collection of essays about citizen science and stewardship published by Yale University Press in 2014. Busch was a contributing editor at Metropolis magazine for 20 years, and is currently on the faculty of the MA Design Research program at the School of Visual Arts and also a visiting teacher at Bennington College. Her work has been recognized by grants from the Furthermore Foundation, New York Foundation for the Arts and Civitella Ranieri. She lives in the Hudson Valley.